Here's a little fun writing inspiration for your LEGO lover. I've noticed that my son (obviously) loves his minifigures. He used to LOVE to write, but recently he has hit a wall with writing and reading. It seems that he needs a little more "encouragement" to do both of these things. Why not use a love of all things LEGO to inspire writing? To that end, I have created a download of LEGO minifigure writing prompts. Included are 10 writing prompts, and lots of lined paper to write! Also included are some small versions of the create your own minifigure printable that can be cut, colored, and glued to popsicle sticks for some fun. Enjoy! 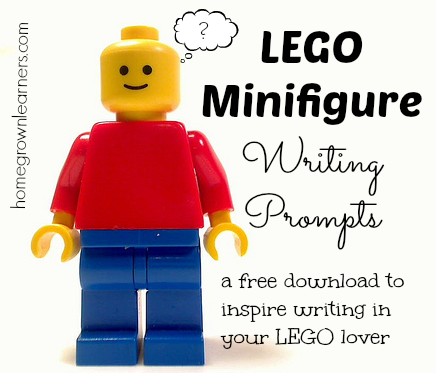 Download LEGO Minifig Writing Prompts. Visit my LEGO Learning page to view more downloads and get ideas for your LEGO lover! What inspires your children to write? Leave me a comment and let me know!! Also, you can subscribe to Homegrown Learners via email so that you don't miss any fun LEGO downloads!